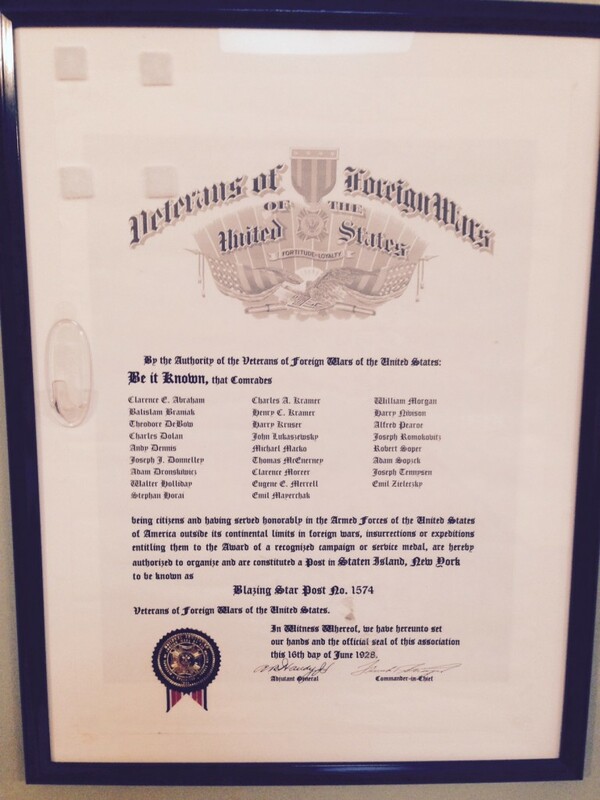 Blazing Star Post 1574 of the veterans of Foreign Wars of the United States, was chartered on 6 June 1928 by Staten Islanders who fought for our Country in World War I. Their purpose was to support Veterans and Service Members as well as to participate in community activities and services. Blazing Star Post continues that mission today with a wide group of Combat Veterans ranging from World War II, Korea, Vietnam, Grenada and Lebanon as well as Iraq and Afghanistan. Blazing Star Post continues that original mission of the World War I veterans and is the fastest growing Veterans of Foreign War Post on Staten Island. If you are a United States Citizen, have served honorably in the U.S. Armed Forces and served in a conflict Zone, Korea or an area where you received Hostile Fire/Imminent Danger Pay, you are eligible to join our Post. Open the Join tab if you would like to join.